I’ve recently started working with LEGO Mindstorms EV3, the latest iteration of the LEGO robotics system. 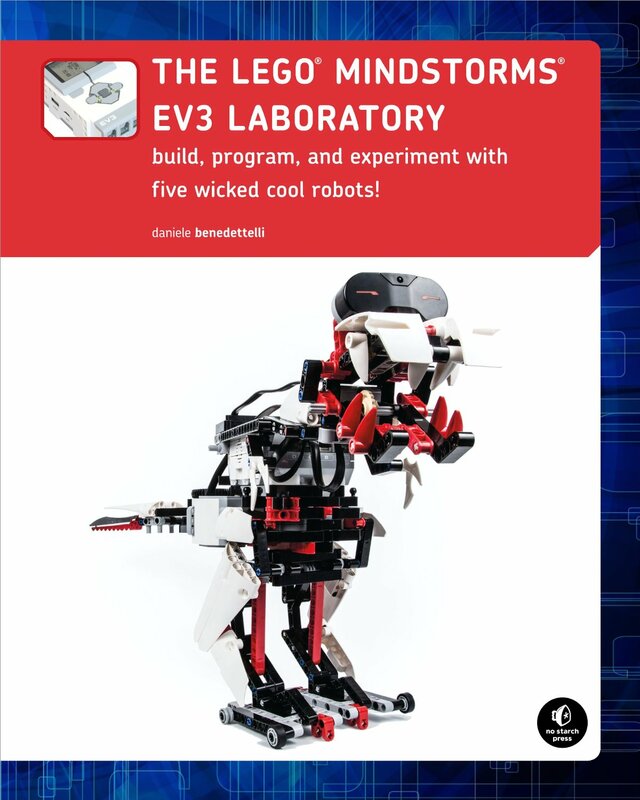 Receiving a copy of The LEGO Mindstorms EV3 Laboratory by Daniele Benedettelli was well timed, since I was learning to use the robotics kit as I began reading the book. The first chapter of the book introduces the parts that are included in the EV3 kit then introduces a robot referred to as ROV3R, which is a small autonomous vehicle with multiple attachments. Each successive chapter for the first half of the book introduces some new concept – from programming to mathematics to using sensors – and how to use that concept, then applies it to ROV3R. Each chapter improves some usage of ROV3R through iterations as it becomes a more complex robot based on the lessons from the chapter and the previous ones. Once the book hits chapter 9, it introduces even more complex concepts, and shows them off using new robots. Each of the successive robots are split into two chapters. The first chapter is an in depth explanation of how to build the robot, explaining how to build a robot that will walk, drive, or attack. By spending an entire chapter on building, Benedettelli is able to go into great detail about the building techniques and how and why it works for the build. The following chapter then goes into the programming involved to make the build, but again by spending an entire chapter showing the programming and how it works, so the subsequent robots are far more complex and more adaptable than the ROV3R from the beginning of the book. Each chapter of the book ends with a comic strip that lasts a couple pages about a scientist and a kid by Arte Invisibile. I like the way these comic strips take the robot from the chapter and make it more accessible to younger readers and readers who may not entirely get the usefulness of the concepts in the robot they have just built or what the reader is about to see. While the LEGO Mindstorms EV3 comes with directions for a few robots on the dvd, they don’t explain why the builder is doing things. This book doesn’t just tell the reader to attach gears, but explains why those gears and the gear ratios. I highly recommend The LEGO Mindstorms EV3 Laboratory for anyone looking to get into EV3 robot building and wants to learn to build their own robots beyond the few included with the kit.